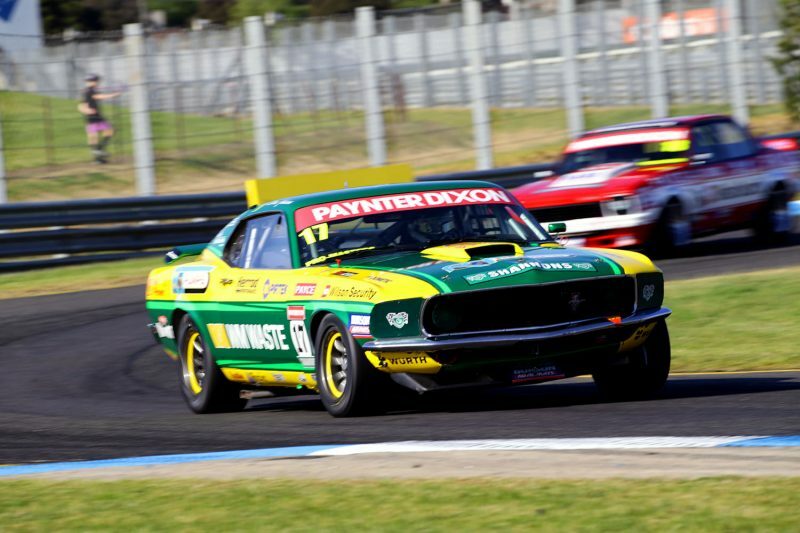 Steve Johnson dominated qualifying for Round 6 of the Paynter Dixon Touring Car Masters series in the opening day of track action at the Rabble.Club Sandown 500. Johnson reeled off a 1:15.712s on his first flyer aboard the Ford Mustang to go to the top before improving to a 1:15.044s on the following lap. Along with securing pole for Race 1, Johnson’s quickest effort proved good enough to beat the TCM qualifying lap record which was a 1:15.238s held by Bowe from 2014. Jason Gomersall (Holden Torana) moved into second momentarily, but was then pipped by Bowe (Holden Torana) at the halfway mark of the session. Bowe found more time on the next lap, but ended up 0.8s off Johnson’s best. Gomersall stayed third at the chequered flag ahead of Adam Bressington (Chevrolet Camaro) and Ryan Hansford (Holden Torana), who completed the top five. Marcus Zukanovic finished up seventh as he debuted his XD Falcon, one position ahead of Cameron Tilley in the upgraded V8 Valiant Pacer. Mark King was forced to limp back to the pits when a ball-joint sheered on the right front wheel of his Chevrolet Camaro. The sole practice session for TCM was topped by Bowe earlier in the day, with Johnson and Tilley making up the top three. Touring Car Masters will be back on-track for a reverse grid Dometic Trophy Race first up on Saturday at 0905 AEST before Races 16 and 17 of the season at 1250 and 1705. 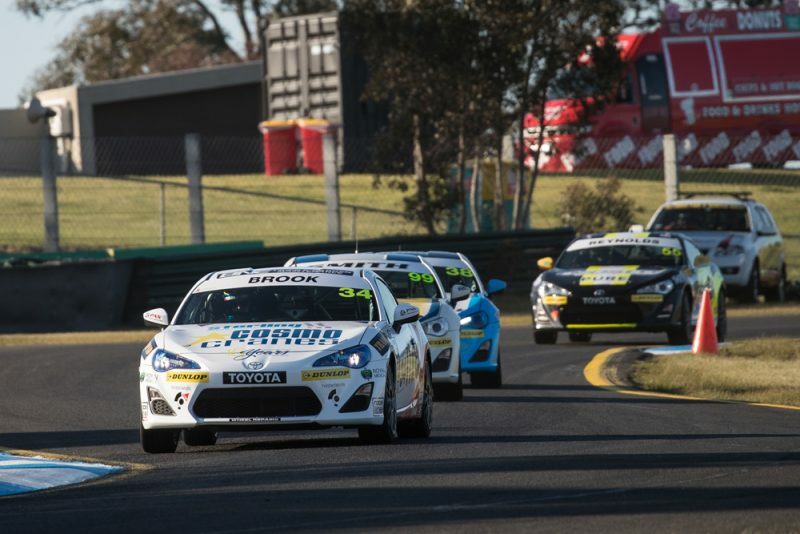 Tim Brook has proved quickest in qualifying for the Toyota 86 Racing Series at Sandown. Utilising a slip stream from Cameron Crick on his flyer, Brook set a 1:26.193s to propel him to the top of the timesheets early in the 15 minute session. No improvements would come in the second half of the encounter, with Brook holding sway by 0.06s ahead of Cam Walton and Crick in third. Luke King was next best, two tenths off the pole time, while practice pace-setter Jake Klein completed the top five. Traffic proved critical in qualifying and so did the tow, with invited rivers Harry Bates and Leanne Tander slipping outside the top 20, in 21st and 24th respectively. Declan Fraser was lucky not to be collected when the Queenslander had a wild moment at Turn 6, spinning and ending up perpendicular to the track on the grass at the downhill complex. He managed to recover and qualify 10th at the chequered flag. Race 1 for the Toyota 86 Racing Series kicks off Saturday at 1035 AEST and Race 2 at 1435.